The New York Fed’s June 25 report by Jaison R. Abel and Richard Dietz, Do the Benefits of College Still Outweigh the Costs? is getting good coverage in the mainstream media. 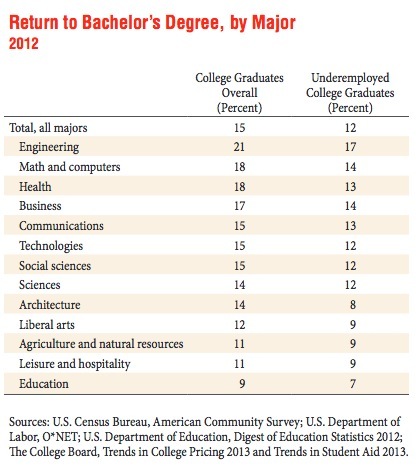 Its major finding is that despite the fall in wages to college graduates due to the crappy economy, a college degree is still worth the expense because wages of high-school graduates have fallen too, keeping the wage premium of a college education high while reducing the opportunity cost of staying in school. However, I am skeptical of the analysis and lack access to the underlying data. The assumption of the study is that education is an investment, and compares returns to stocks and bonds. However, except for children who have money of their own and the freedom to invest it, this is a spurious comparison. A proper analysis to look at the free cash flows and discount that by a risk-adjusted discount rate. There are two ways of doing that. You either deduct the financing costs from the cash flows and discount the resulting amount by an equity cost of capital, or you take the gross cash flows and discount them by a weighted average cost of capital. It would also need to allow for what happens when students don’t find work and wind up paying higher interest rates (as in it would have to calculate those scenarios and weight them by the frequency of occurrence, for instance, 17% for engineering grads versus 8% for architecture grads). Maybe finance managers just enjoy living on the edge. What else would explain their weakness for using the internal rate of return (IRR) to assess capital projects? For decades, finance textbooks and academics have warned that typical IRR calculations build in reinvestment assumptions that make bad projects look better and good ones look great…the most dangerous problems with IRR are neither isolated nor immaterial, and they can have serious implications for capital budget managers. When managers decide to finance only the projects with the highest IRRs, they may be looking at the most distorted calculations — and thereby destroying shareholder value by selecting the wrong projects altogether. But let me turn briefly to a much more important issue, which is the perverse nature of thinking about education as an investment. This is yet another manifestation of the degree to which citizens are inculcated to view the social order through the lens of markets. Now the sad reality is that students who don’t have rich parents do have to think about college in mercenary terms. That’s due to the radical restructuring of labor markets over the last two decades. It used to be that unemployment levels generally were at not all that high and the bad periods were relatively short, plus new college graduates were sought after as high energy and relatively cheap workers. So if a college graduate did well in school, was presentable and had a decent personality, they were pretty much assured of finding paid work, even if it wasn’t their dream job. Another troubling issue is the failure to recognize the role of education, including college education, in creating shared norms and knowledge. The punditocracy regularly wrings its hands over increasing political discord in the US, and that is at least in part due to the neglect of the intellectual commons. I recall reading that around the time of Locke was the last era when it was possible for someone to master what was considered to be the main elements of human knowledge in their lifetime. That would now clearly be a ridiculous aspiration. The implication is that various experts and validators determine what is considered to be knowledge and competences worth acquiring, and what gets treated as secondary or irrelevant. After the first successful experiment with large-scale propaganda, in World War I in the US, there was a bit of a backlash when the public realized how easily their beliefs had been manipulated. Some of the participants in that effort, such as Walter Lippmann, argued that the complexity of the modern world meant that experts would need to distill for the ordinary person what was important and not important; they couldn’t be expected to master the needed expertise. Lippmann clearly meant this as well intended paternalism, but the implications were troubling. Yet despite the uncomfortable recognition that social and information consensuses were increasingly managed, there remained a generally shared consensus about the value of education, and of what the major elements were, like having read Shakespeare, Milton, Goethe, knowing the major elements of the history of science, at least a smidge of philosophy, and a good grasp of the history of the West. A great deal of this was probably inertial: there was no obvious reason to reject the traditional canon, only to add to it. And mass media also reinforced broadly shared cultural values. In other words, even though the elites were shaping opinion in Lippmann-esque ways, part of the objective was to maintain a social consensus and inculcate positive values (the fact that these would support the status quo and hence the current social order was assumed to be virtuous). When I was a kid, there were only three major broadcast networks, and two major news magazines that had mass influence (Time and Newsweek). Now with media fragmentation and political strategies that focus on inflaming voters on narrow hot-button issues, the idea of cultivating an intellectual and social commons isn’t just quaint, it is seen as irrelevant to the interests of those at the top of the social order. The perception that higher education is justified only as a means of getting better paid work (or from the employers’ perspective, of getting at least somewhat trained candidates) is a manifestation of a much bigger form of neglect, of a lack of willingness to make investments for the betterment of the citizenry, independent of immediate payoffs. The only bit of hope is that social values have changed radically in the last 30 years, which means they can be reshaped. But people under 35 have only experienced the march of neoliberalism and its framing of individuals as isolated consumers. And citizens of all ages are under much greater economic pressure than ever before. Nevertheless, identifying the various commons that are being taken away from us is the first step in trying to regain them.